Getting your wedding cake from A to Z without damaging it can be quite a daunting thought but with preparation, care and organisation your delicate and wonderful wedding cake can arrive at the venue intact. Taking your cake in tiers and assembling it once you arrive at the destination can be the best and safest way. 1. Ensure that each tier of the cake is placed onto a baseboard. The bigger the tier, the heavier the baseboard should be. 2. Place each tier into a sturdy box that is the same size as the baseboard. The bottom of the box can be reinforced with masking tape and double sided sticky tape can be used on the underneath of the baseboard which will help give it extra stability by adhering to the cake box. 3. Do not place any of the decorations or pillars inside the box with the cake - these may cause minor damage to your cake while being transported. 4. If your cake is highly decorated and not able to be placed inside a box you can transport the tiers on large pieces of foam or placed in a box with added lengths placed along the sides of the box making it much taller. 5. The boot of your car can be made level to transport the cake and you can use cut out bits of foam in between the boxes to stop them from sliding around. Even if your car has air-conditioning never place the cake in the boot when the weather is hot or humid. 6. Find a flat place inside the car to put the boxes on. Don't place them on car seats as they have a slight angle and chances are your cake will slide within the box and be dented or crushed. Fold down the seats and use a large bit of flat wood, carpet foam or a non-skid mat to make the surface level. 7. While driving the vehicle try and make the journey as smooth as possible by avoiding any sudden jerks or brakes and give yourself plenty of time to get to the venue without the need to speed. The last thing you want is to have to break sharp and your cake goes flying in the back seat! 8. Do not make any other stops while your cake is in the car - go directly to your venue and any last minute stops can be made on your return home. 9. Once you reach the destination you can ask if there is a wheeled cart or anything else that will help you load the cake onto. This will be a much safer and easier way than carrying. 10. Do not try and lift the tiers out of the boxes but rather cut the sides away and this will ensure the cake will slide out easy and in one piece by you holding firmly onto the sides of the base. 11. 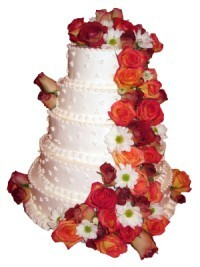 Reconstruct your wedding cake on the table where it is to remain during your reception. 12. Take time to inform the event manager or a member of staff that the wedding cake is now in place and care should be taken if tables and chairs are to be arranged around it. 13. Be one step ahead by taking along a repair kit as a 'just in case' scenario. Extra icing with a decorating bag, a spatula and any extra decorations you may have. If your cake is unable to be broken down into tiers and you find you have to transport it whole you can keep the cake sturdy by placing a dowel directly through all the tiers. Sharpen a long dowel to a point. Wipe to remove any wood shavings or splinters. Hold the dowel straight and centre it at the top before very carefully pushing it down through the cake till it reached the bottom of the base. Gently turn the dowel when going through each cardboard layer. If the dowel sticks out of the top of the cake, place a small nick or mark where it is flush with the top of your cake. Take out the dowel and cut it just below your mark. Reinsert the dowel after wiping it clean and use butter-cream or icing to fill in the hole. Decorations of flowers or toppers will hide any marks that may occur. Place your tiered cake onto a plywood or fibreboard base with a thickness of at least � inch. If you are having your wedding cake made and you are picking it up direct from the bakery it will already be placed safely in boxes in such a way that transporting it will be easier. 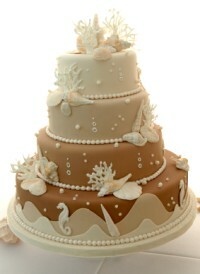 With extra care, time and thought one of the crowning glories of your special day can be transported in one piece. Did you find this article useful? Help Google to tell others!